We wanted you to be the first to know effective 2/1/2015 we will be in network with United Healthcare Commercial Insurance. The commercial products are UnitedHealthcare Choice and Choice Plus, UnitedHealthcare Select and Select Plus, UnitedHealthcare Options PPO, Navigate and UMR. We are excited to offer our comprehensive services including access to our gastrointestinal endoscopy center to all United Healthcare commercial insurance participants. Please feel free to contact us with any additional questions you may have. Thank you for continuing to allow us to participate in the care of your patients. We know healthcare insurance and medical billing can be confusing. And we want to help. Please take a moment to review this page to help you understand some key points about insurance coverage and billing procedures at Digestive Care Center. If at any time you have a question, you can always contact one of our trained billing and insurance staff who will be happy to answer your questions. If you have insurance coverage, it’s important to be prepared for out-of-pocket costs such as deductibles, co-payments, co-insurance and non-covered services. Payment is due at the time of service. You will be asked to read and sign the Payment Policy Agreement at the time of your first visit. The Digestive Care Center billing team will send you a Benefit Verification letter outlining an estimate of out-of-pocket costs for potential procedures and services. This amount will be collected on the Date of Service. We recommend that you contact your insurance company to verify participation and costs prior to your procedure. For additional financial assistance, you can download our application here. We accept payment by cash, check, VISA, MasterCard, American Express and Discover. Digestive Care Center will bill your procedure to the primary insurance company and to a secondary insurance company, when applicable. Please ensure we have a copy of the most up-to-date insurance information each time you visit. Ultimately, you are responsible for the charges associated with your procedure as outlined in the Payment Policy Agreement. Following the processing of your claims, if your insurance company pays more than anticipated towards your services, a refund will be issued. If you have a balance due on your account, you’ll receive a statement. Statements are mailed out on a 28-day billing cycle. If payment is not received on your account or financial arrangements are not established with a member of our billing team, any past due account will be reviewed for submission to an outside collection agency. This is in accordance with the Payment Policy Agreement. As a courtesy to you, we will contact your insurance company to obtain pre-authorization or pre-certification for services provided by our office. Prior authorization does not guarantee coverage and/or payment by your insurance company. It is always a good idea for you to contact your insurance company prior to any procedure to verify costs, coverage benefits and prior authorization for services. Patients without insurance or those having high-deductible insurance plans should contact the billing department in order to make payment arrangements before services are rendered. Payment is required at the time of service. In addition to our accepted payment methods noted above, both no-interest and interest-based financing options are available to patients who qualify. We will provide a credit application to initiate getting you qualified for a personal loan. Insurance companies often provide screening coverage for routine screening colonoscopy. However, if during the course of your routine screening the physician removes a polyp or performs a tissue biopsy, the procedure may be considered diagnostic and may not qualify for coverage as a screening. In this case, you may be responsible for all or part of the procedure cost. It is important for you to discuss this with your insurance provider to determine your out-of-pocket costs in these instances. 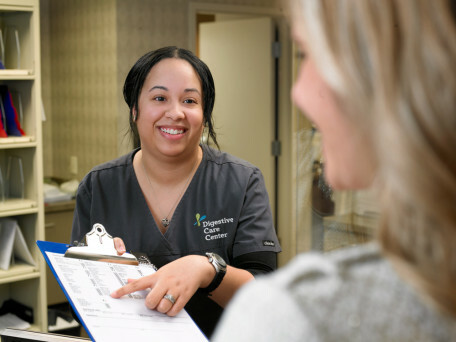 Providing an ideal experience for our patients means we are always respectful of your time — and do all we can to accommodate each patient’s scheduling needs. To help accomplish this, we ask that you be on time for all appointments, especially outpatient procedures — which means arriving early to complete any needed paperwork. We know that conflicts happen, so we also ask that you notify us as quickly as possible should you need to reschedule your outpatient procedure for any reason — please contact us at least 48 hours prior to your scheduled outpatient procedure. Outpatient procedures that are cancelled/rescheduled without sufficient notice (24 hours) will incur a charge of $50.00. Please note: This charge is not covered or paid by any insurance company, it will be billed directly to the patient. Disclaimer: This is a general listing of participating insurances and networks. Please contact your provider prior to your visit to verify coverage.